Having advocated pasta as a possible slimming dish I thought I would blog this lovely easy recipe. 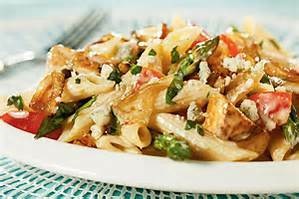 The preparation time is only 20 minutes and cooking time a mere 8 minutes for the sauce and 10-12 minutes for the penne pasta. Remember to only eat a moderate portion if you are dieting, like me! Prepare the asparagus by by scraping the sides. Cut off the ends of the spears about 1 inch from the bottom. Cut the ham into strips about ½ inch thick. Cook asparagus for about 2 mins in boiling water slightly salted. Drain and allow to cool, then cut into 1 inch lengths, leaving the tips whole. Melt the butter in a sauté pan and add the asparagus and ham. Cook briefly to evaporate the liquid. Then add the cream. Bring to the boil and cook for 5 minutes to thicken the cream. Meanwhile cook the pasta in boiling salted water with 1 tbs oil for about 12 minutes. Drain the pasta and rinse under boiling water. Toss in a colander to drain and mix in the sauce.